I have come a long way from the girl who grew up thinking that the only way to eat a potato was baked with lots butter and salt, (always a classic and a favourite with Gordy). Growing up we ate lots of potatoes but the only time I remember eating sweet potatoes was at the holidays when they were sliced, layered and baked with apples, butter and brown sugar, (another favourite with Gordy). Then in the 90's restaurants starting serving up an alternative to french fries by offering sweet potato fries on their menus and I thought yeah, healthy fries - I was kinda sad when I realized otherwise. That's why I am really excited about sharing this recipe with you. My sweet potatoes are packed with lots of veggies, black beans, spices and when served with a green salad make a most delicious healthy meal. Sweet potatoes are one sweet veggie that are packed with lots of fibre, vitamins and potassium. This recipe is vegan, gluten free and 100% Gordy tested! Roast sweet potatoes for about 1 hour, or until fork tender. Slice sweet potatoes in half. Scoop out flesh and place into a large mixing bowl. Place skins back onto a parchment lined cookie sheet and return to oven and bake for 5 minutes, or until the skins become crispy. Remove skins from oven and fill each skin with black bean mixture. (You may have extra filling, depending on the size of your sweet potatoes). Place back in the oven and bake again for 20-25 minutes, or until filling is heated through and tops are starting to get crispy. Place all ingredients into a food processor and mix until smooth and creamy. Add more water or lime juice if needed. Taste and add more lime juice or salt if needed. If you want to thin out the dip add a bit of water or lime juice. 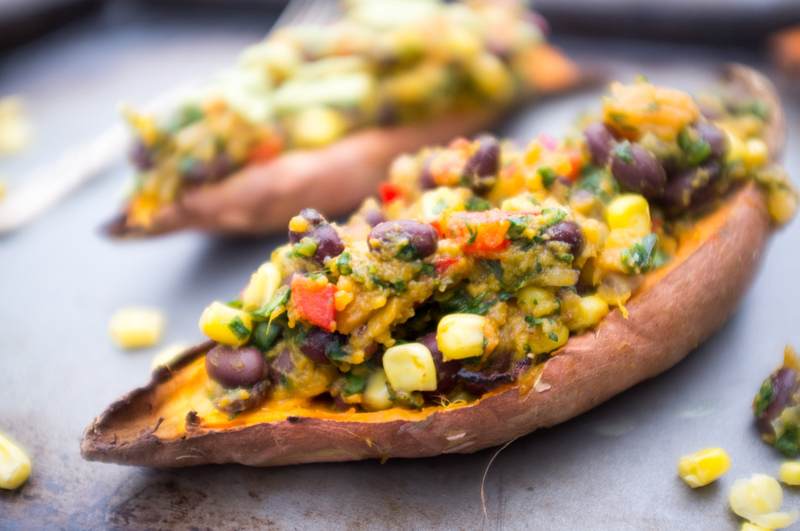 Drizzle all over baked sweet potatoes or use as a dip. These can be made-ahead and reheated. I like to serve with extra hot sauce on the side. 2016 is the International Year of Pulses (IYOP) as declared by The United Nations General Assembly to celebrate one of the world's most important foods. And since Canada produces 35 per cent of the global pulse trade and since I am Canadian and eat lots of beans well lets celebrate lentils, chickpeas, dried beans and peas. 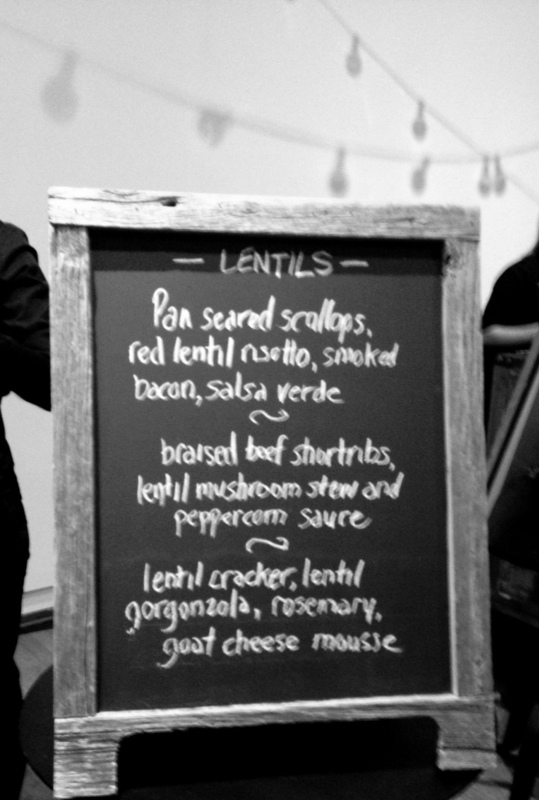 I never thought I would be invited to a party that praises the glory of the bean but last month I was one of hundreds of guests at Pulse Feast, which to my surprise tuned out to be a very elegant affair at the Design Exchange in Toronto. I just did not put together beans and a cocktail dress, but they still let me in in my jeans and plaid shirt. The host of the evening was celebrity chef Michael Smith. But the real star of the evening was the Pulse. Here is my recipe to celebrate the International Year of Pulses. Using a food processor chop all veggies; peppers, carrot, celery, onion, garlic and kale until finely minced. You can do this with a knife but since you are already going to use the processor for the beans you may as well use if for the veggies too. In a large saute pan, add oil and cook the veggies for about 5 or 6 minutes, or until soft. Set aside. Process drained and rinsed black beans in the a food processor, (no need to clean processor from the veggies) - until the beans are broken down but not mushy. I like to keep back about 1/2 cup of the beans to add after to give the loaf extra texture. In a large bowl combine the black beans, oats, egg and all the seasoning. Add in the sauted veggies and mix well. You may want to use your hands. Put mixture into a well oiled or parchment lined loaf pan. Place the cut cherry tomatoes, maple syrup, balsamic vinegar and cayenne pepper in a small bowl and mix. Spoon on top of the prepared loaf. Serve with spicy mustard or your favourite dipping sauce. These days we have so many choices when buying fish; wild or farmed, organic farmed, fresh or frozen. I like this recipe using salmon but I know it would be delicious on cod or halibut. You can use whatever kind of fish you like for this recipe but please don't dip in ketchup! To prepare fish, combine the first 8 ingredients in a small bowl, and brush evenly over fish. Arrange fish on a parchment lined baking sheet. Broil for 12 to 15 minutes or until done. Sprinkle with sesame seeds and a big squeeze of fresh lime. I often double this recipe, I find it tastes even better the next day for lunch. Serve over wilted baby spinach or braised red cabbage. No food says Hanukkah more than the latke, it can be made as many ways as there are Bubbies. My mother's latke recipe was handed down from her mother Jennie: grated potatoes, eggs, a a handful of matzo meal, salt and pepper, fried in lots and I mean lots of oil, so much that you could smell the latkes cooking before you got off the elevator to her apartment. I remember watching my grandmother peel and grate the potatoes by hand. Me, I like to keep the skin on and use my food processor. When making latkes there is always discussion about the right way to make them...russet or yellow, flour or matzo meal, onions or no onions, processed or grated, corn or peanut oil...I still try and follow my grandmother's recipe but with something a little extra...I add sweet potatoes for a for colour and a crunchy texture. I think this makes a really pretty latke. At Hanukkah time my mother and her brother Syd each had their own plate of latkes, my mother said she would eat six latkes and more if she was allowed. I am not sure if I could eat six, but I know that Zachary and Gordy could. Now off to make some apple sauce. Chag Sameach and Happy Hanukkah. This recipe makes about 20 to 25 latkes that are crispy with golden edges and moist interiors. Using a food processor with your grating blade, grate the potatoes. Try and squeeze out as much liquid as you can but I do not work to hard at this. Add potatoes to a very large bowl and add in the onion, egg, matza meal, salt and pepper. In a large frying pan heat oil over medium heat, make sure to add enough oil to cover the bottom of the pan. Add a big spoonful of latke mixture into the hot pan - do not overload the pan, I like to cook four at a time for about 4 to 5 minutes on each side or until golden. Make sure to push them down with your spatula. and cook or until golden brown. You will need to add more oil between batches. (Don't be afraid to use too much oil). Drain well paper towels, (you will need a lot of these). If not serving right away they can be reheated or I like to make them a few days ahead and put in the freezer. When reheating place the frozen latkes on cookie sheet lined with parchment paper and bake for about 10 to 15 minutes at 400 F until hot. Drain well on paper towels. Serve with home-made apple sauce and sour cream. I love taking my time walking around grocery stores. It doesn’t matter if it is a big chain store or my neighbourhood fruit store, if you pass me and I don’t say hello it is because I am busy reading labels or looking for the kohlrabi. Really...most of the time I rush through grocery shopping, but last week I found myself wandering the aisles at McEwan. That is fun for me. McEwan is a shopping adventure that starts the moment you enter. It did not take long to covet some fruity olive oil, bars of dreamy chocolate, jars of McEwan's own preserves and beautiful canisters of tea. Nothing better then a cupboard full of jars of goodness, I am ready for anything. This is where a good shopper (that's me) knows to have some quality stuff stashed in the pantry and freezer for days when there is no soup simmering on the stove. This Apple and Arugula Flatbread is easy and only take a few minutes to throw together. The flavours are a twist on the classic pairing of apples and cheese. Made with store-bought naan that I topped with McEwan Apple Sauce... instead of tomato sauce, thin slices of apples in place of pepperoni and creamy Mozzarella di Bufala instead of shredded cheese. This is sweet and savoury 'pizza' that I promise you won’t get from delivery and it takes less then 30 minutes to make! 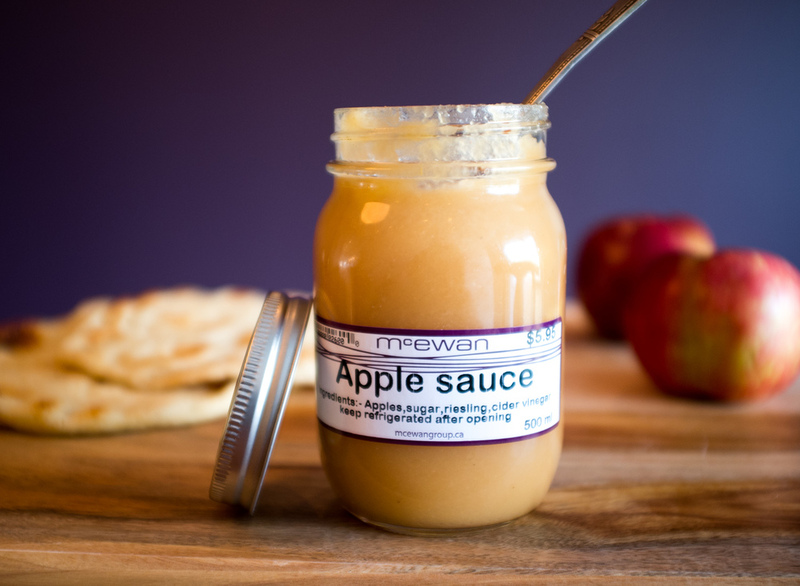 McEwan apple sauce is more hearty and chunky than the usual store-bought applesauce and comes in a cute mason jar. Drizzle of olive oil and salt and pepper to taste. Place Naan or flatbread on a pizza pan or cookie sheet. Top with apple sauce, cheese, apples and onion slices. Bake for 10 minutes or until the cheese is melted. Top with arugula, a drizzle of olive oil and salt and pepper. Go ahead and try this recipe with your own homemade pizza dough or baguette. There are so many kinds of flatbread to try, Middle Eastern pita bread, Mexican tortillas, Italian focaccia and they all freeze well. These flatbreads make a wonderful party appetizer or light meal. Use any cheese such as ricotta or chevre. If you have any fresh herbs sprinkle some on top, fresh thyme, basil or parsley (finely chopped) would be delicious. Add a green salad and you will have a super quick meal. I like to finish the flatbread with a drizzle of really good fruity olive oil, fresh cracked black pepper and very coarse salt. This post was sponsored by McEwan, the opinions expressed here are my own. 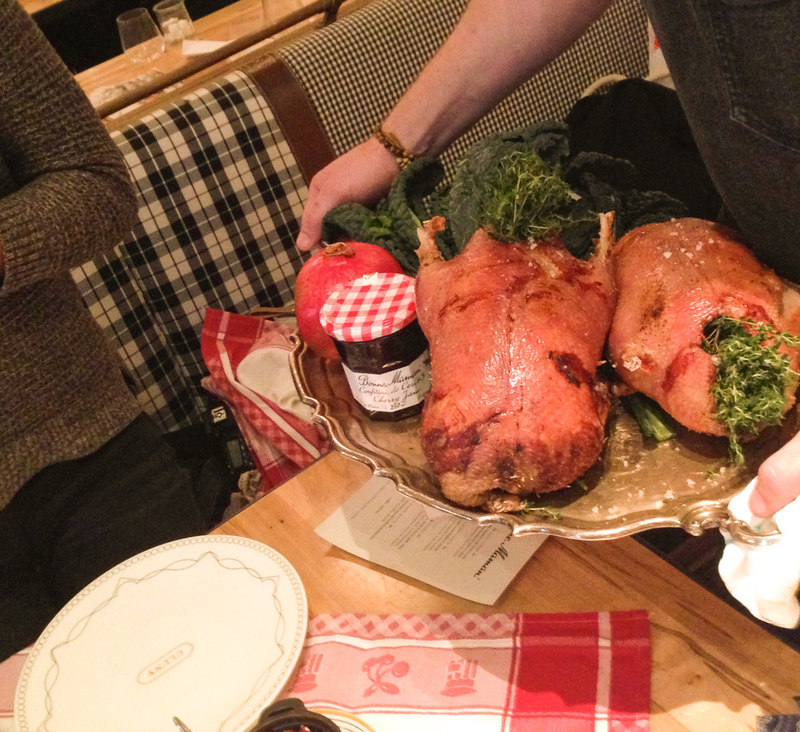 What happens when you put together a great chef, a group of foodies, bloggers and the best French jams…? 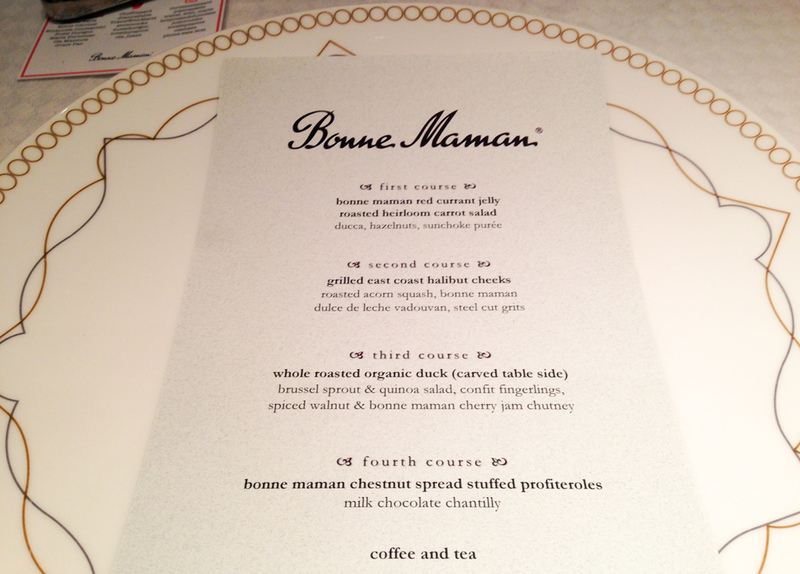 I was invited to join a group of foodies and bloggers for a tasting menu inspired by the jams and jellies from Bonne Maman at Cluny Bistro in The Distillery District. The menu used the jams in the most tasteful way - to add a bit of sweet and bit of savoury. Our lunch started with me eating a basketful of bread, I did have to try all the jams after all, just part of the job. Our first course was a plate of brilliantly roasted heirloom carrots which Chef Paul Benallick slow roasted for eight hours in butter (he did mention it was a lot of butter) and Bonne Maman Red Currant Jelly. The plate was brilliant. The second course was grilled East Coast halibut cheeks, acorn squash and Bonne Maman Dulce de Leche served on top of steel cut grits. – I need this recipe please! Our third course was a whole slow roasted organic duck with Bonne Maman cherry jam, and black walnut chutney served with brussel sprouts, quinoa salad and confit fingerlings. Save room for dessert! Dessert … Bonne Maman chestnut spread stuffed profiteroles, milk chocolate chantilly, red currant jam and nut clusters Happiness is on this plate. There was also a lot of talking, photographing, instagraming and twittering going on. I sat across from the beautiful TV personality Chef Christine Tizzard, her media accomplishments include appearances on CityLine, Steven and Chris and Rogers Television. She shared with us her passion for fresh food and love of cooking. I left with a goodie bag of Bonne Maman jams and lots of inspiration, I can't wait to try them in my own recipes from the sweet to the savoury. Check out my easy recipe using Bonne Maman Dulce de Leche. 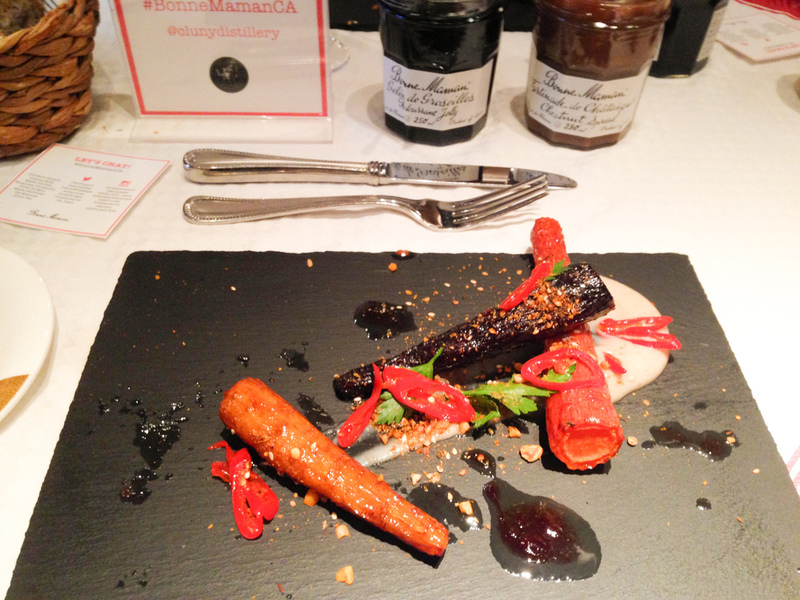 The delicious Bonne Maman Jam and Spreads. Thank you Branding & Buzzing, Cluny Bistro, the most beautiful French restaurant in Toronto and Chefs Paul Benallick and Christine Tizzard for hosting a delicious afternoon. I will be back soon. Growing up my mother always cooked squash. I remember eating butternut squash smothered in butter and brown sugar, baked until golden and gooey. As we grew more sophisticated in our tastes spaghetti squash showed up on our plates that my mother tried to pass off as 'spaghetti' but we knew better. I just discovered delicate squash - I am now in love -- it is one of the tastiest of the winter squash, with flavours of sweet potatoes and corn and the skin is edible too so no need to peel them. I think it’s just about the perfect fall veggie. Everything I love to eat is stuffed into this squash. On a cookie sheet lined with parchment paper, or a glass pyrex place squash cut side up, and drizzle with olive oil, salt the za'atar. Place in oven and bake for about 40-50 minutes or until squash is ready. Remove from oven and set aside. I like to start preparing the filling while the squash is baking in the oven. First cook the quinoa or rice following the package directions. You will need a 1/2 cup of cooked quinoa or rice. Stuff each squash half with about 1/2 cup of the stuffing, depending on the size of your squash. Serve warm or with the tahini sauce, pomegranate molasses and pomegranate seeds on top. Feel free to add a dash of extra za'atar on top too. Place all ingredients in a small bowl , and mix with a fork until well combined. Gradually stir in small amounts of additional water until the desired consistency is achieved. This recipe works well with any beans, try chickpeas or white kidney beans. You could also use swiss chard or spinach in place of the kale. I like to make my own pomegranate molasses as the store bought ones are make with lots of sugar, mine is sweetnend with honey. Though I do keep a store bought bottle on hand when I don't have time to make my own. Here is my recipe. The tahini sauce can thicken up if not used right away, thin out with a little water or some lemon juice if it becomes to thick. My mother use to make meatloaf with a tin of Campbell's Vegetable Soup and boy was it good. Her recipe was made with ground beef, condensed vegetable soup, bread crumbs and spices. My veggie loaf is made with beans, oats and chia seeds. I was tempted to add a tin of soup but I really can't remember the last time I bought one, sorry Campbell's. This may be a little different from my mother's meatloaf recipe but I can say it is just as tasty. I am loving this straight from the fridge with fresh tomatoes, tossed greens, a spoonful of dijon and a sprinkled of hemp hearts. 1 1/2 cup dried mung beans which yields 4 cups of cooked beans, here is how I cooked the mung beans. 1 cup ground oats, (make the ground oats by putting oat flakes into a food processor and process until the oats reach a very fine consistency). Make your chia egg by mixing the chia seeds with the water, stir and let sit for about 10 to 15 minutes or until is becomes a gel-like consistency. In a food processor, chop onions, garlic, carrots and celery until finely minced or you could chop by hand. In a sauce pan heat oil and sautee the chopped onion, garlic and celery for about 5 , then season with the chill flakes, thyme, salt and pepper, set aside. Back in the food processor, (no need to clean from the veggies) - process the beans, they should still be chunky. In a large bowl add the cooked veggies, beans, ground oats and the remaining ingredients. Mix well, this is where I find it much easier to use my hands to get everything well combined. Taste and adjust seasonings. Put the mixture into the prepared loaf pan, pressing the mixture firmly into the pan. Make the glaze by mixing in a small bowl the ketchup and maple syrup, brush over loaf. Bake at 350F for about an hour, let loaf sit for about 15 minutes before removing form pan. Before serving sprinkle with a handful of hemp hearts. Remember to let the loaf sit for at least 15 to 20 minutes before cutting - I enjoy this best the next day straight from the fridge with some hot sauce or dijon mustard. The hemp seeds add some added crunch and nutrition too. I made mine with Mung Beans but I am sure it would be delicious with any beans. This recipe was adapted from Delicious Everyday. 1 pound mushrooms, diced, you can use a mix or any kind you like. In a large frying pan over medium heat add the olive oil, onion, carrots and celery and then the mushrooms. Your pan will be very full but don't worry as the mushrooms with shrink down. Remove the dried mushrooms from the water and chop. Save the water. Add mushrooms to the pan. Then add the tomato paste and increase the heat and add the red wine, the liquid from the mushrooms and vegetable stock. Bring to a boil then reduce the heat to low and simmer for 5 to 10 minutes or until about half of the liquid has been absorbed. Remove from the heat. Place mushroom mixture in 4 ramekins or an 8 x 8 square pyrex, set aside. Then prepare the cauliflower. Chop the cauliflower, add to a large saucepan. Cover with water and bring to a boil. Season with salt and cook the cauliflower until tender. Drain and set aside. Place the cauliflower in a food processor with 2 tbsp olive oil, nutritional yeast, mustard, cayenne pepper, nutmeg, salt and thyme leaves. Spoon on top of the mushroom mixture, drizzle with truffle oil and bake for about 20 minutes. The truffle oil is meant to be a finishing oil. Just a little drizzle on top, less is more! If you don't like truffle oil just leave it out. Yale loves pad thai. Her go-to take out is Flip Toss & Thai on Harbord Street, close to U of T. Its quick healthy take-out thats easy to eat when studying. Now that school is over and out (!) - it's time we do some cooking together. I love to have Yale in the kitchen. That is how I learned to cook, by watching my mother create wonderful meals…meatloaf mixed with Campbell's Alphabet Soup, chicken parmigiana breaded in cornflake crumbs and bowls of spaghetti tossed with Kraft grated parmesan (cheese) in the green tin. Our kitchen became more sophisticated when I became older, rib steaks broiled in the oven from Nortown, leafy romaine salads, (no iceberg here) tossed in homemade garlicky dressing that my mother coveted, the recipe given to her by the famous Carmen from the even more famous Carmen's Steak House Restaurant on Alexander Street. I learned to chop onions and garlic with lots of encouragement, "don't chop your fingers off with that knife, " "wash your hands" and "don't burn down the house." Kelp Noodle Pad Thai (we made ours with grilled shrimp).This is very similar to another kelp noodle recipe I have on my blog, try them both. This recipe was adapted from: A Health Foodie. Feel free to add tofu, tempeh or seafood to this recipe and any other veggies that you like. 2 zucchinis - cut into long spaghetti strands (this is where the Spiralizer comes in VERY handy). 1 tsp almond butter or any nut butter you have. For the protein (optional): You could use any of the following or a combination of both. tofu cubes - cut tofu into bite-sized cubes and add them to the wok with the garlic and ginger. cooked shrimp - add to the wok with the vegetables. (I bbq my shrimp and added them in at the end). scrambled eggs - add to the wok just before serving. lime wedges, some lime zest and a squeeze of lime juice. handful of bean spouts or any sprouts you like. extra hot sauce, (on the side for dipping). Start by soaking the kelp noodles in hot water until they pull apart and soften. Using your Spiralizer, prepare the zucchini, if you don't have a spirlalizer you could use a vegetable peeler or a box grater. On medium heat add the coconut oil to a wok or large sauté pan. Add the garlic and ginger and cook until soft. Add the kelp noodles, sauce and vegetables and mix well, simmer for about 3 minutes. To serve divide the noodle mixture into two bowls and add the garnishes. Are you bored with oranges and apples? Then head to Chinatown where the mango are in season, piled high and priced to move. I can't resist buying a case and eating them all, but I did save a few for this recipe. 1. Combine all the ingredients and season with salt and pepper. 2. I like to make the salsa ahead of time to let the flavours develop and adjust seasoning before serving. 1. Prepare barbecue (medium-high heat). 2. Brush salmon lightly with Dijon mustard. 3. Season with salt, pepper, lime zest and a squeeze of lime juice. 5. Grill until just opaque in the center, about 5 minutes per side. Serve with salsa and garnish with cilantro. Have you been outside yet today? So far today I experience wet snow, sharp winds and now sunshine. And yes, I am fully aware that it is just crazy that anything over freezing feels tropical. My calendar says that spring has arrived, though there is still snow in my front yard, what is that about? Enough I say, its time to get outside. Goodbye to comfort food. Hello to Spring. And since its to cold to pop open the sunroof I think I will head directly to the kitchen and make something pretty to brighten up my day. So I have this big bag of carrots in my fridge - I have made carrot soup, carrot muffins, carrot salad and I still have more carrots. I guess you could say I love anything carrot! These carrot fritters are easy to make…. I used chickpea flour, which is high in protein and gluten free, and no worries if you don't have chickpea flour in your pantry, any flour will work, but you know I am always trying to hide some healthiness in my recipes hoping that certain people will not notice. And since I like to measure the success of my recipes on my family, these carrot fritters were deemed delicious. I added a spoonful of Thai Kitchen Massaman Curry Paste to the mix - it only took a teaspoon or two to turn these carrot fritters into exotic carrot fritters, the curry added the perfect balance to the sweet carrots. So if you want to spice up your day, or brighten up your day or you just love Spring or love carrots, (like me) - then this recipe is for you. Hello spring. In a large mixing bowl combine the carrots, cilantro, chickpea flour, onion, curry paste, garlic and salt. Add in the beaten eggs and stir until well combined. Add the coconut oil in a large skillet over medium-high heat. Spoon the fritter mixture into the hot pan. Cook for about 3 to 4 minutes per side or until golden brown. You can make ahead and reheat on a cookie sheet. Add more curry paste if you like them super spicy. This little jar of Thai Kitchen Massaman Curry Paste adds a big punch of flavour and it was picked by CNN as one of the best foods in the world! I will be making this next…Curry Fried Rice. You can find Thai Kitchen at Metro. Many of my best cooking ideas come when I am walking along the Beltline Trail. I first started walking/jogging along the Beltline with my father in the 1980's, in those days you could still see the wooden tracks of the rail road. Later I walked with my children in strollers, tricycles and two-wheelers and now I walk with Gordy, friends or alone. The tracks are gone, my kids grown and my father passed, but walking along the trail I sometimes think I can still feel the outline of the tracks, hear the train whistle or see my father with his long legs always walking two steps ahead. These burgers are perfect in a bun or on their own. I have been using parsnip in lots of recipes lately, in muffins, loaves or roasted in the oven, I can't seem to get enough of this root vegetable and find that I am shredding it raw into salads and adding it in soups. Where does your cooking inspiration come from? This recipe makes 10 mini burgers. Rinse beans well and let drain. Sauté the onion and garlic for a few minutes until onions are translucent. Add the carrot, all the spices and cook a couple minutes or until carrot is tender. Turn off the heat and set aside. Mix well and then shape the mixture into patties. I like to make mine mini but you can make them any size you like. Heat the same pan you used to sauté the onions and add a bit of oil. I like to finish my burgers off in the oven for about five minutes per side to make them crispy on the outside. Serve with a bun and all the toppings or on top of your favourite greens. Gordy collects pens, Zach loves old books and typewriters and Yale miniature tea sets. I love dishes. What I love about my vintage dishes is that I don't have enough of any one pattern for a full set so it becomes a game of mix and match. Playing with dishes as an adult is just as much fun as those tea parties you had as a child…off to boil the kettle. This stew is basically made out of seasonal mushrooms like portobello, button and oyster mushrooms. It is perfect comfort food for these long December days. Serve in your prettiest bowls. I purchased these plates many years ago in an antique shop in Montreal. In my collection I have 4 dinner plates, 4 salad plates, 4 soup bowls, 1 serving platter and 1 serving bowl. 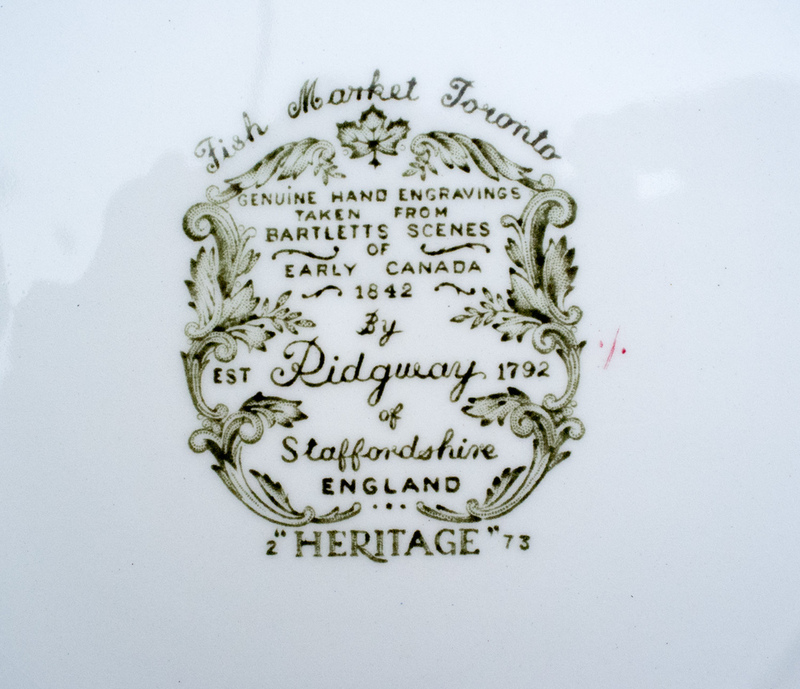 Some of the sketches on the dinnerware are: The Rideau Canal Bytown, Citadel of Kingston, Fish Market Toronto, Scene Among The Thousand Islands, Wigwam in the Forest and The market Place Quebec. 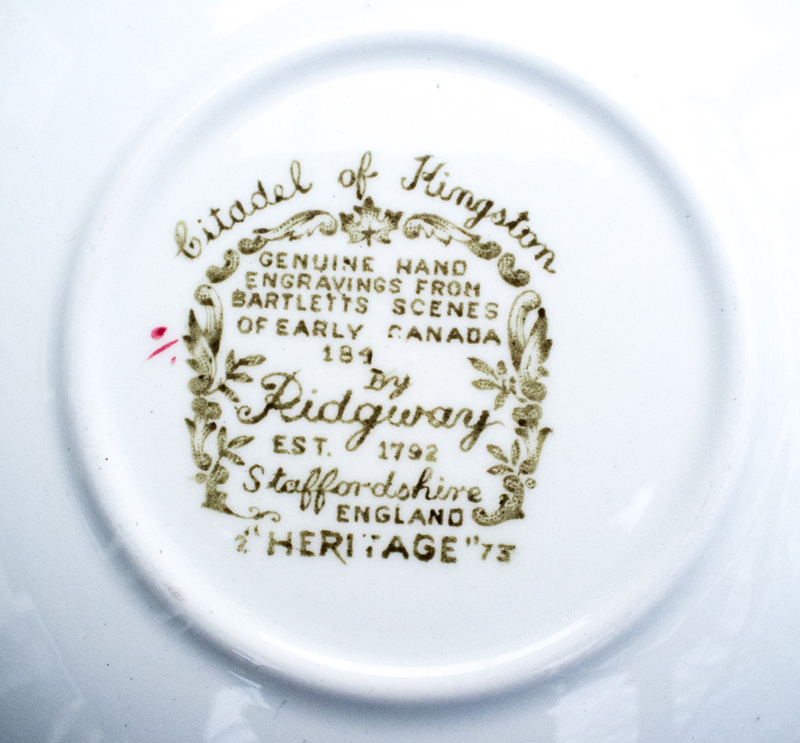 Ridgway's "Heritage" pattern merged Canadian history and colorful dinnerware. Manufactured by Ridgway Pottery of Staffordshire England in the 1960's, the earthenware pieces feature hand applied colors over a dark green transfer. 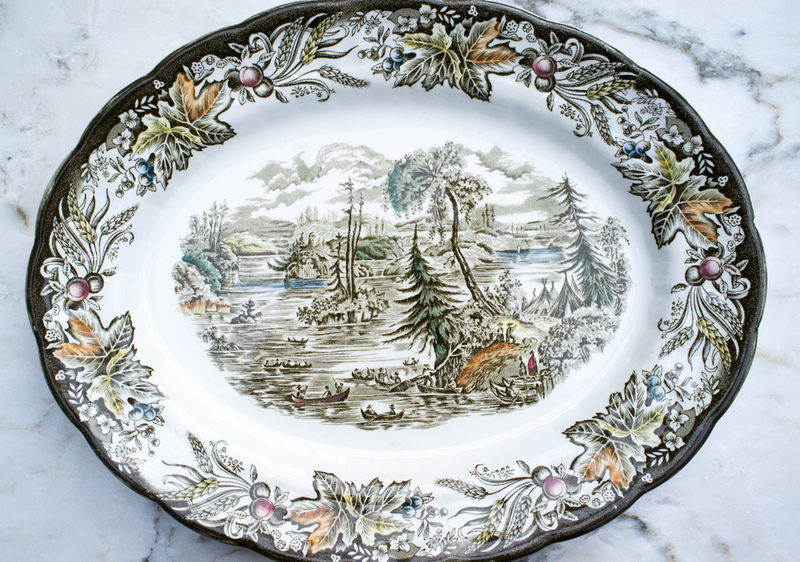 "Heritage" pattern was adapted from a series of sketches and sepia watercolors composed by William Henry Bartlett, then a twenty-nine year old english artist. From June to November 1838 Bartlett traveled through eastern Canada creating the works. These were later engraved onto steel plates for mass printing. Images from Bartletts journey were published as "Canadian Scenery Illustrated", an 1842 collection featuring over one hundred steel engravings. Serve in your prettiest bowles. This recipe will make enough for 3 to 4 servings. 5 c. mushroom stock, you may need more at the end of cooking, (see recipe below), you could use vegetable stock. Heat the olive oil in a large sauté pan over medium heat. Add the onion, celery and carrots. Cook for about 5 minutes, or until softened. Add the garlic to the pan and continue cooking until you can smell the garlic. Add the sliced mushrooms and cook for about 7 to 10 minutes or until the mushrooms are soft and have released all the juices. Pour in the wine, the dried mushrooms and add the thyme, sage, red pepper flakes and salt and pepper. Cook 2-3 minutes more, or until most of the liquid has evaporated. Add the mushroom stock and buckwheat groats. Bring to a boil, then reduce heat to low. Partially cover and cook 15 minutes, or until groats are tender. Serve with chopped parsley, lemon zest and freshly ground black pepper. 8 to 1o cups of water. Place all ingredients in large pot with 10 cups water, and bring to a boil. Reduce heat to medium-low, and simmer 45 minutes. Strain, pressing as much liquid from vegetables as possible. If not using right away store in the fridge or freezer. I have tested this recipe using red and white wine. The red wine will give the stew a bit more depth in flavour and colour. Do not overcook the buckwheat, it should have a little bite to it. I like to taste as I cook, feel free to add salt and pepper or more spices to your taste. Don't leave out the garnishes, the lemon zest add brightness and the parsley colour. Next time I make this recipe I will try adding some chopped spinach. As a side dish how about a green salad with some thinly sliced pears. If making ahead and reheating, you may need to add a bit more stock as the buckwheat soaks up the liquid. And like any stew this tastes even better the next day. These burgers are delicious on a bun on over a salad with your favourite topping or dressing. Next time I will try these grilled on the Weber - Gordy. Dinner at my maternal grandmother Jenny's, (we called her 'Nanny') always included a platter of well cooked burgers. As soon as you stepped off the elevator (The Marquesa Apartments on Bathurst Street) you could smell onions frying. Her burgers were well seasoned with salt, pepper, ketchup, Worcestershire sauce, breadcrumbs, and eggs and always cooked in an electric frying pan drowned in shmaltz (chicken fat) and mound of fried onions. She made enough burgers for a small army, (my mother would say) and we each had to eat at least two, my father was expected to eat three, (out of sight he called them hockey pucks). When we left we took home leftovers and the scent of the frying onions clinging to our clothes. I never forgot those burgers. I think my Nanny would like these veggie burgers, mine were cooked on a cast iron skillet. This recipe makes 6 burgers that your Granny would love. Bring water, sweet potato, and quinoa to a boil in saucepan over medium heat. Cover, reduce heat and simmer for about 20 minutes, or until the quinoa is cooked. Transfer to bowl to cool. Stir chickpeas, grated zucchini, seeds, hemp hearts or flaxseeds, parsley salt, pepper, chili powder, and thyme into the quinoa mixture. Mix well, mashing the chickpeas and sweet potato but leaving some chunks. I used my potato masher. Heat oil in a large skillet over medium heat. Cook patties about 3 minutes per side, or until lightly golden brown. Remove from heat, and place on baking sheet. Did I say this was meatless? What makes this pasta so hearty and rich is the lentils and yes it is meatless, thought you could have fooled me, but not Gordy. The weber was lit and Gasparos sausages were cooked. Happy all around. Heat oil in a large saucepan over medium-high heat. Add onion and sauté until softened and starting to brown (5 to 7 minutes). Add garlic and crushed red pepper and cook until fragrant, about 1 minute. Stir in lentils and broth and bring to a boil. Reduce heat, cover and simmer until lentils are tender (about 20 to 30 minutes). Meanwhile, in a large pan sauté mushrooms and eggplant in olive oil until soft. To the mushrooms and eggplant add the tomatoes, vinegar, and rosemary and fennel seeds, sun dried tomatoes, salt, pepper, sugar and stir until combined. Add the cooked lentils to the tomatoes. Bring to a boil again, reduce heat and cover. Simmer for 40 minutes. Serve over zucchini or pasta and garnish with olives. Gordy's sausages on the Weber. My friend Jayne invited me to a cooking demo – to my surprise we were handed an apron, so much for watching someone else cook do the cooking. Our instructor was Galya Sarner, Director of the Israeli-Canadian Project. Galya was born in Jerusalem, her parents from Baghdad and Israel, later in life Gayla lived in Paris with her husband before moving to Toronto. She shared with us her many stories about the joys of shopping for fresh ingredients in the local markets. The menu for the evening reflected this – a unique mix of influences from markets in Bagdad, Israel and Paris in what she calls ‘Jewish-Iraqi comfort food with a French twist’. Now it was time to roll up our sleeves and get to work. She had a ‘market’ spread out for us with all the foods we would need. Thirty of us, all cooking together, gathered up eggplants, dried fruit, fresh herbs, and got to work. One hour later we were eating a feast of Kichree, Labane, Kubbe, Sabich and more. This eggplant dish was my favourite. I have added my own touch with a drizzle of pomegranate molasses, which is a good substitution if you can’t find fresh pomegranates or use both like I did. Slice eggplant lengthwise and sprinkle with salt and pepper on the inside part of the eggplant. Bake face down on a cookie sheet covered with parchment paper or tin foil. Broil for 15 to 20 minutes, or until the eggplant is black on the outside and very soft on the inside. In a large bowl, mix the tahini, water, garlic and lemon juice. Keep mixing until the mixture is very smooth. Taste and adjust, you may need more water or lemon. In a large, uncovered saucepan, heat pomegranate juice and honey on medium high until the honey has dissolved and the juice simmers. Reduce heat just enough to maintain a simmer. Simmer for about 30 to 40 minutes or until the juice has a syrupy consistency and has reduced to about half. Once cooled, pour into a glass jar. Any leftovers can be stored in the refrigerator. If you want your pomegranate molasses to be sweeter, add more honey to taste while you are cooking it. Place eggplant on a platter, drizzle tahini, then the pomegranate molasses, pomegranate seeds and a handful of chopped fresh parsley. Eat with pita, a baguette or challah.